﻿To build a safe, ethnically, equitable and racial social just place for the Latinx LGBT+ community in Dane County where the LGBT+ community can thrive. ​A new initiative called Orgullo Latinx LGBT+ of Dane County has been created to support and enhance the lives of the Latinx LGBT+ community in Dane County. 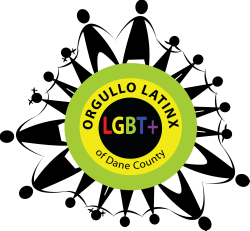 Orgullo Latinx LGBT+’s mission is to build a safe, ethnically, equitable and racial social just place for the Latinx LGBT+ community in Dane County where the LGBT+ community can thrive. This initiative’s vision consists in engaging the community to cultivate an equitable and safe environment for the LGBT+ Latinx community. Education - creating awareness about the barriers that enhance the struggles of the LGBT+ Latinx community in Dane County. Outreach - developing culturally educational materials to disseminate information about the LGBT+ Latinx community and share resources. Social Justice – engaging the community at large to cultivate a place of equality, respect, and dignity. Advocacy - fostering empowerment and ensuring that our LGBT+ community rights are respected and honored. Community Engagement- strengthening our partnerships with allies, families and community groups.